I undertake all guitar repair and servicing work from major reconstruction work, refrets, splits, cracks and breaks to electrical repairs, setups and parts upgrades. Below are a few examples, (more to follow). Click here for my current repair price guide. The photos below show the repair of a Gibson Les Paul headstock. Gibson guitars are particularly prone to this type of damage due to the style of construction. 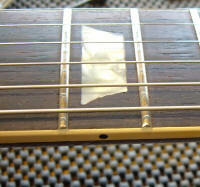 The neck is made from one piece of mahogany and the steep headstock angle creates short grain behind the nut add to this the removal of timber for the truss rod access at the thinnest part of the neck and the weight of a Les Paul, and it isn't surprising that we see so many breaks of this type. This repair was aided by the black finish which makes an invisible repair more possible, translucent and clear finishes can prove more problematic. The fibre head veneer found on most new Gibsons is quite strong and tends to keep everything aligned, the vintage re-issue guitars with holly veneers tend to split and separate into two pieces making re-alignment that much more difficult. My advice to anyone with a Gibson guitar is: When not in use, keep it in its case. Gibsons do not like guitar stands! The finish reacts with rubber and they do have a tendency to leap off the stand for no apparent reason. This break was particularly nasty. The neck was completely snapped in two with some compression damage to the fibres. The polyester finish makes invisible repairs almost impossible, any translucent finish will still reveal the cracked polyester lacquer underneath, however a delicately applied opaque colour over the black front hides the damage. USA Stratocaster truss rod nut replacement. A tricky repair. When the two way nut on an American made Fender becomes worn it can be difficult to get enough torque on the nut to tighten it. Removal and replacement is a delicate job. My own guitar. I bought this in 2006 from Guitarworks in Reading. 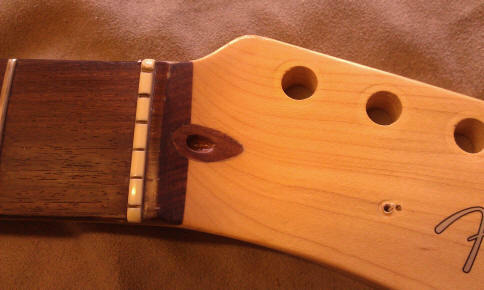 The guitar had previously had a headstock repair and neck refinish that I was far from happy with. The head had been repaired with two steel rods and a lot of car body filler, two materials that I feel don't belong on a vintage instrument. In addition the finish, which had become rather opaque on the back of the repair and lumpy on the headstock face, had been given a razorblade faux checking job and the logos were wrong. My task was to remove the filler and rods and replace them with mahogany, re-spray the neck with the correct finish and replace the Grovers with some original 60's Klusons. 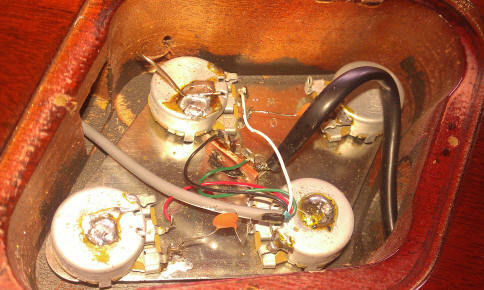 Click here to see how I repaired it. 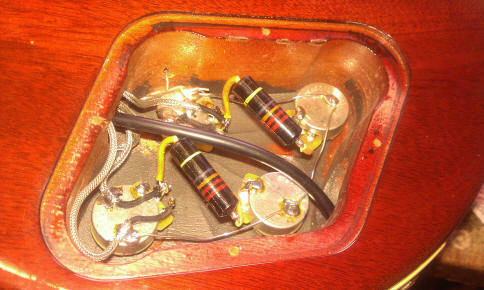 Standard stock wiring Rewired to vintage spec. The original harnesses from the early 2000's are mounted on a metal plate and often have 300k CGE pots that on this instrument were actually reading 260k. The loss of treble with such low value pots is huge and changing the pots and caps is the first thing I always recommend when people ask me how best to improve the sound of their Gibson guitar from this period. Much cheaper than fitting new pickups and gives a noticeable difference. I offer full vintage replica upgrades for both Fender and Gibson style guitars. Like this one, complete with new pots and replica caps, all wired to a period correct schematic. Or I can also custom wire a harness to your specifications using multi pole switches, stacked pots etc. email me for details. 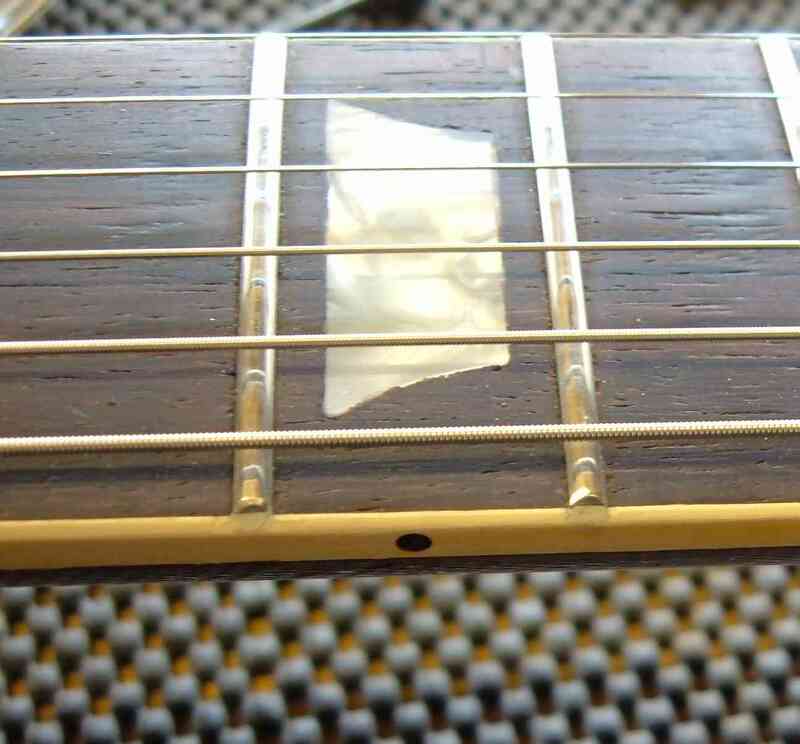 The photos below show a Gibson Les Paul Deluxe that had very loose and uneven frets and a missing 21st fret inlay. It is common when re-fretting Gibson guitars to remove the little binding nibs from the end of the frets and fret over them Epiphone style, these frets were not seated very well and some of them were pushing the binding away from the fretboard. I remembered seeing an article in an old Stew Mac catalogue showing how binding nibs could be replaced using melted plastic. After numerous re-sprays and re-wires it was time to return this guitar to it's original condition.